Collage is an ideal medium to think about constructedness, and about different contending realities existing in tension. But the act of cutting up my own paintings to make those works is fully charged with symbolic meaning. About taking the preciousness of a hand made expression, and dismantling it. To me this sort of creation/destruction motif is reminiscent of Hindu theology, where the two processes go hand in hand. One destroys in order to make space for something new. I think also of those beautiful works done in sand which, when complete, are destroyed and started all over again. One might see the creation/destruction polarity in Christian imagery as well; the dying seed which springs to new life, the phoenix rising from the ashes. Destruction represents a kind of opening of possibility, while still causing a ‘rupture’ or discontinuity in time and space. More immediately, the tearing apart which Irish adopts as his working method here is a reflection of our culture; a constantly shifting, fluctuating milieu in which our own identities are thrown into a state of dissociation. There is risk here, uncertainty; but also the possibility of growth. 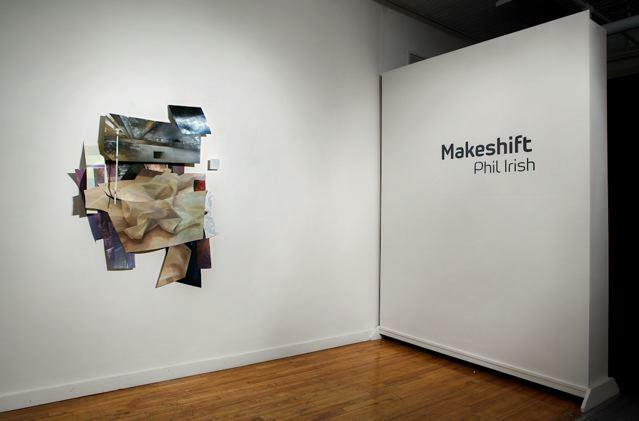 Makeshift is a painterly environment that holds creation and destruction in tension. 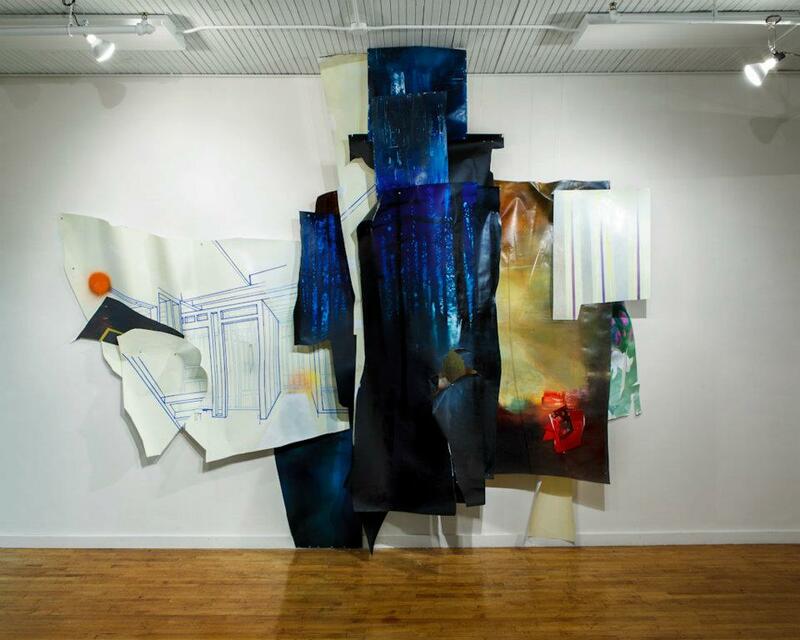 A collage at an architectural scale, Makeshift has evolved through putting painterly representation under great strain. There is a rich practice of painting: layered in surface, mark making, visual languages, and the array of images. Irish has undone this constructive labour, however, slicing and puncturing it with a knife. 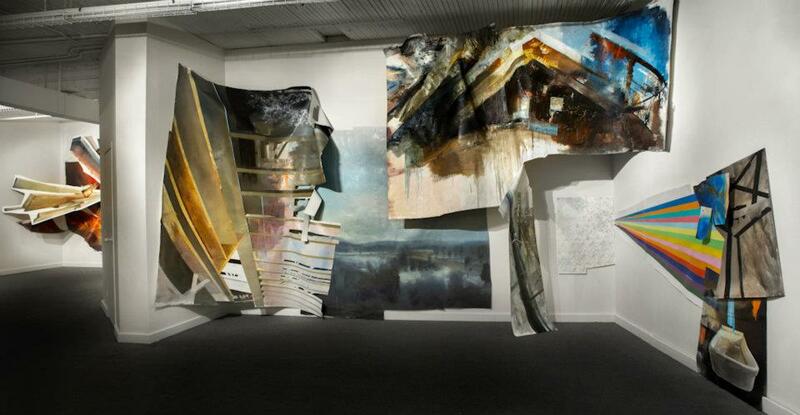 He has then reassembled the fragments and shards to create a symbolic interior space. The imagery is of a kind of home, but a home where everything is contingent and shifting, where inside and outside are confounded, and where a longing to construct is contending with a destructive energy. In our culture, the house is often conceived as a still point in our hectic lives. In contrast to this stasis and intimate safety, Makeshift presents us with a most un-safe house, where the greatest aspects of one’s inner life are at stake and, terrifyingly, transformation is precisely what is hoped for. A larger exhibition of Phil’s work is slated to appear at Cambridge Galleries in a few months, with some of the pieces from “Makeshift” serving as the core of the show – I will be interested to see where he takes these painterly ideas next.